Reviewed by Master Gardener: Stephanie Suesan Smith, Ph.D. Many who used vermiculite for gardening may be a bit worried about recent health scares related to vermiculite. Vermiculite is a naturally occurring mineral that is mined and processed into a puffy, lightweight granule mixed with soil to improve aeration and drainage. It used to be inexpensive and easy to get. Problems with one mine that produced the majority of commercial vermiculite have made it difficult to find in some parts of the country and people worry that it is no longer safe. Improves aeration: It loosens the soil so roots can more easily reach down and grow through the soil. Adds permanent soil conditioner: Unlike compost, which eventually breaks down into the soil, vermiculite doesn't break down. Compost does add vital nutrients, but if you need to permanently improve drainage, vermiculite is a great solution. Most commercial potting soils come premixed with vermiculite, so there's no need to add it. When you spread a bit of soil out, you can see brown to golden-brown mica looking rocks in the mix. Check the ingredient label. You're looking at vermiculite. You can purchase bags of horticultural-grade vermiculite and work it into garden soil according to the package directions too. Vermiculite for gardening sounds safe, simple and effective, and it is - with one catch. Some vermiculite may contain trace amounts of asbestos. Before you throw away your bags of vermiculite or potting soil, you should know a few things about this situation. Most contaminated vermiculite came from a mine near Libby, Montana, that supplied about 70 percent of all the vermiculite sold in the United States for most of the 20th century. In the late 1990's, the mine was shut down when it was discovered that the rocks from which the vermiculite was mined also contained asbestos, and the asbestos fibers were contaminating the vermiculite. Asbestos creates tiny fibers that float in the air and when inhaled can damage the lungs. After the Libby Mine closed, vermiculite was difficult to obtain because so much of the supply was cut off abruptly. 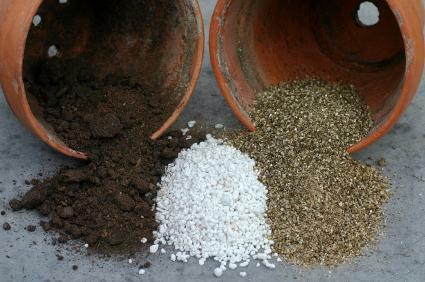 Vermiculite for gardening became more difficult to find and perlite took its place in many potting mixes. Today, mines in South Africa, China and other parts of the world produce safe vermiculite for home use. It's still hard to find in the big box stores but local garden centers frequently carry small bags. If you have bags of vermiculite in the garage, most experts believe you can use it safely even if you're not sure where it came from; the majority of vermiculite sold for gardening use was considered safe, with mostly the commercial vermiculite in such large quantities that any asbestos contamination created risk. Dampening down the vermiculite before mixing it into soil, wearing a mask, and working with it outdoors can lower any potential risk. Anything sold today is likely safe, especially given manufacturers' caution after the Libby, Montana problem. Vermiculite is an entire site devoted to vermiculite, with chemical composition, industrial and gardening use explained, and more. The Environmental Protection Agency discusses the vermiculite contamination problem and offers some suggestions, mostly if your home has vermiculite insulation. The State of Minnesota also provides vermiculite contamination information on its website.